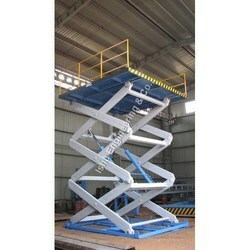 Our range of products include car lift, two wheeler unloading scissor lift and hydraulic car lift. We are a professionally managed organization and have carved a niche for ourselves in the international market. We manufacture, supply and export of Car Lift, which are powered by hydraulic or pneumatic motors and possess the capability of lifting heavy loads and higher vertical travel distance. Sturdy construction, precise size and excellent durability are the slient features of these scissor lifts offered by us. Electrical and Building roof maintenance and many Industrial application. 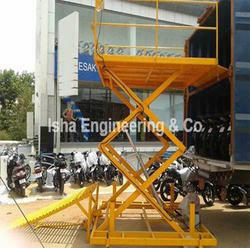 Two Wheeler Unloading Lift used for Automobile Industries, Two wheeler Four wheeler showrooms, Engineering Industries, Motor industries, Warehouse, Steel Industries, and granite industries. 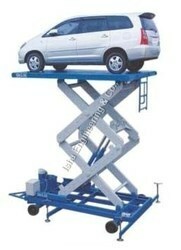 Keeping in the mind various requirements of our clients, we are offering premium quality Hydraulic Car Lift. Widely used to offer competent working support in areas like automobile garages, offered lift is manufactured by our experienced professionals utilizing the best quality components and advanced technology in line with industry norms. The provided lift is available in diversified sizes and designs so as to cater the needs of our clients. Looking for GARAGE LIFT ?